The hotfix will go live at 6:30 pm. Return to login screen. When you fly to orbit, the download of the hotfix starts. At 7 pm the Iron Banner will go live. There should be enough time to download and install the hotfix. At 11pm, all guardians who have not already installed the hotfix will be removed from their activities and taken to the login screen to download the update. - There should be "quality of life" improvements, so small changes that improve the player's experience. However, the community manager Cozmo gave more detailed information. He revealed that this hotfix would also bring the changes to the silver dust that he announced a few weeks ago. The patch will change the silver dust economy to enhance the player experience. Bungie wants the players who master the most difficult challenges in "Rise of Iron" to be rewarded for their success. Therefore, in the future you will not need any silver dust to apply the ornaments from the trials, the "Wrath of the Machine" and the "Iron Lord" armor. For exotic weapons ornaments you still need the currency. In addition to this, the Dusty Iron Engrams are adapted: If you dismantle the gear you find in it, you are currently getting Legendary Marks. After the patch you should get a silver dust for it. However, in winter major changes to the silver dust economy are expected to result in a more positive player experience. - A problem was fixed where players came onto the roofs of the skyline. 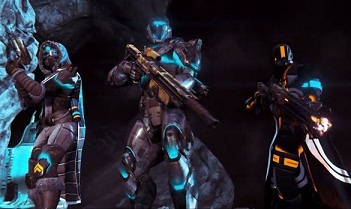 - Vanguard and Crucible Weapon Weapons were not properly decrypted from engrams. - The ship Comitatus did not come as a reward from factional packages. - Dusty iron engrams don't give legendary marks anymore, but a silver dust. - It now costs no silver dust to apply "Iron Lord", Trials and Raid ornaments. - The first time a raid boss is killed on normal difficulty, he drops 3 SIVA key fragments. During the second kill in the week there are two fragments and the third kill only one. - In the fourth kill and all the following, there are no more fragments for this week. - Heroic bosses kill will behave exactly the same.